Home Companies Changzhou Zangoo International Trade Co.,Ltd. 1. R-12 sight glass manifold.with three 60"color-coded hoses. 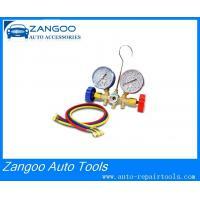 What is air conditioning gauges manifold? Air conditioning gauges is used to measure air conditioner units pressure within closed-system to evaluate or troubleshoot the central air units. Gauges manifold set is the most frequently used item when it comes to refrigerant or pressure. test system, purge the system with nitrogen, and perform other necessary tasks. The gauges manifold set includes the hoses, the manifold, the valves, the compound gauge (low pressure gauges) and high pressure gauge. uestion1: Did you accept products customization?Is they need mould fee? Answer: Yes, we accept products customization.Need mould fee,because the customization products usually need extra mould cost.But,we can return the mould fee when you reach a specific quantity. Question2: Can we get free samples? Answer: Little quantity normal copper fitting samples can provide for free except for delivery cost. Question3: How long is the normal production period for a 20-foot shipping container? Answer: According to the current productive capacity, usually needs 30 days from producing to delivery. Question4: What is the type of payment? For R12 , R22, R502 refrigerant gas. Size of hose: 36"(90cm) in red, yellow & blue. Working pressure 500 PSI Burst 2500 PSI. A sight glass aluminum testing manifold body. Designed to meet 1/4" SAE requirement for refrigerant permutation. and exquiste craft,you will feel more practical/convenient/sately.